Warning: This page is outdated (September 2018). Agora Octave is a place dedicated for rapid collaboration related to GNU Octave and distribution of community contributed code and packages. You can browse code submissions or contribute your own. Tags and Flags. Is this what we want? 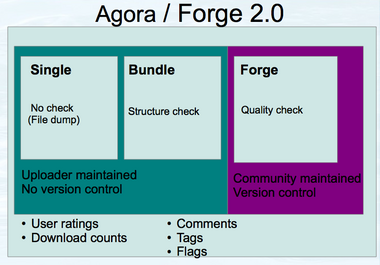 You can upload your code to Agora. The code is classified according the following criteria. The file is full responsibility of the uploader. Octave and Agora do not check or support this submissions. The file(s) is(are) full responsibility of the uploader. The bundle passes a structure check to see if it is compatible with the builtin Octave installer. This doesn't mean the bundle with install flawlessly. The file(s) is(are) responsibility of its maintainer and the Agora maintainers community. This package will install using the builtin Octave installer. At least one package maintainer. Must install and work with the latest Octave release. The must be released under a GPL compatible license. All functions (except private ones) must be documented using Texinfo. The package must have all the required files. If the package has a doc folder it should be written in Texinfo. No shadowing of Octave core functions. No direct inclusion of external dependencies. a good read when thinking about this, is a Zen of Comprehensive Archive Networks with some afterthoughts on the the design of CPAN. I think that an important thing to learn is to get something as simple as an anonymous FTP server working.